This past December, Yale University Press published Sarah Osborn’s World: The Rise of Evangelical Christianity in Early America by Catherine A. Brekus (University of Chicago). The publisher’s description follows. In 1743, sitting quietly with pen in hand, Sarah Osborn pondered how to tell the story of her life, how to make sense of both her spiritual awakening and the sudden destitution of her family. Remarkably, the memoir she created that year survives today, as do more than two thousand additional pages she composed over the following three decades. Sarah Osborn’s World is the first book to mine this remarkable woman’s prolific personal and spiritual record. Catherine Brekus recovers the largely forgotten story of Sarah Osborn’s life as one of the most charismatic female religious leaders of her time, while also connecting her captivating story to the rising evangelical movement in eighteenth-century America. A schoolteacher in Rhode Island, a wife, and a mother, Sarah Osborn led a remarkable revival in the 1760s that brought hundreds of people, including many slaves, to her house each week. Her extensive written record—encompassing issues ranging from the desire to be “born again” to a suspicion of capitalism—provides a unique vantage point from which to view the emergence of evangelicalism. 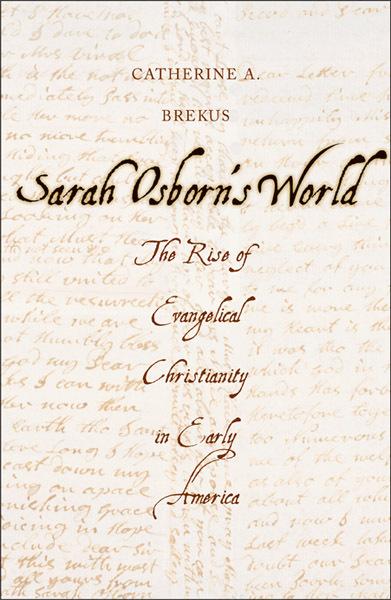 Brekus sets Sarah Osborn’s experience in the context of her revivalist era and expands our understanding of the birth of the evangelical movement—a movement that transformed Protestantism in the decades before the American Revolution.